Bring Your Models to Life with the StereoEnabler! If you are a chemist or biologist studying molecular structures, a GIS professional involved in analysis of 3D geographic data, a design engineer working with analysis software, an architect using 3D modeling, or a software developer adding real-depth perception to your software, and you want to use any desktop PC where the graphics card driver supports stereo, but there is no stereo connector, you need the StereoEnabler. Accurate interpretation of 3D information is critical to getting your projects understood and approved faster. StereoEnabler, the newest Stereo3D visualization product from StereoGraphics, brings you the toolkit you need to add stereoscopic true depth visualization to your PC. Now you can clearly review designs, simplify complex analysis, validate molecular structures or interpret spatial analysis faster and better than ever before. Collaborate with colleagues, find errors faster, finish projects sooner - all on your desktop. StereoEnabler connects right into your monitor and Stereo3D viewing device. StereoEnabler's 3-pin connector is based on standards established by VESA (Video Electronics Standards Association). 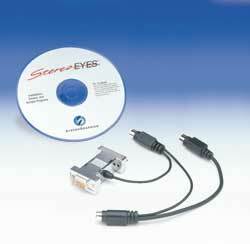 This ensures compatibility with all VESA-compliant, stereo-ready graphics cards.